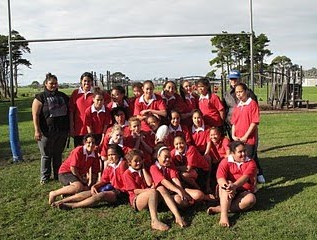 On Tuesday 7th of June 2011 Pt England rugby girls went to Onehunga to play rugby against St Joesph’s girls. They were huge. I was nervous and didn't want to play, but I had to be brave playing for my school. When I got on the field in my mind I was like its time for war. They got the first two tries but in the second quarter we got some tries and were in the lead. But they got the good girls and scored some tries but we were in the lead by a conversion but they got tries and kicks overs and was in the lead. Bobbi-grace got a try, she was so happy that she jerked at the try line.Tina got two tries we were all so happy because that puts us in the lead then, by there conversion they won the game and we lost but it was better then the last year because they got no points!! !